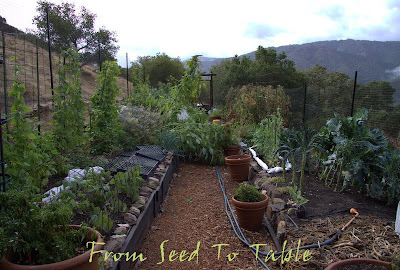 Ok, this post is only minimally related to my garden but I had to share anyway. I love pomegranates! When they come in season I buy a bunch and put them in a bowl on the dining table where I can admire them and get inspired to use them in various ways. Perhaps I'll actually plant a tree someday, but in the meantime I'm happy to buy them. I have to say, I'm not trying to be self sustaining in all things from the garden. 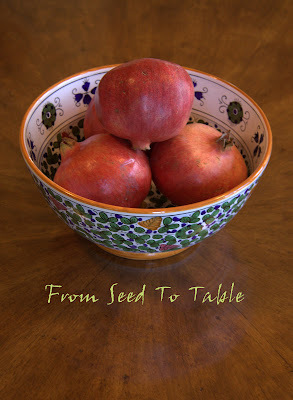 California produces some of the most amazing produce and I'm perfectly happy to take advantage of the best that's out there and I think that the commercially grown pomegranates are fantastic. Hmm, I was about to say wonderful, but that's actually the variety name of the fruit grown by the largest commercial grower in the state. Chances are, if you are buying pomegranates from a store anywhere in the U.S. you are buying that producer's fruit. But, I still think their fruit is, um, really good. Actually, back in my Master Gardener days, I had the opportunity to taste a lot of different pomegranate varieties side by side. Do you know what my favorite variety was? Just take a wild guess. Can't figure it out? Well, it happened to be what the big guys are growing. That made it so much easier to put off planting my own tree. Anyway, after admiring that bowl of ruby fruit for about a week I started looking for recipes. I came across a recipe for a Turkish salad that had walnuts, green olives, pistachios, and pomegranate seeds. That sounded great to me, but my husband is not crazy about walnuts, so I started improvising and here's what I came up with. It is different enough from the original recipe that I feel quite comfortable calling it my own. Chop the olives and sweet peppers (remove the seeds and ribs) into bits about the same size as the pomegranate arils. Remove the seeds and ribs from the chile pepper, or not as you prefer, the heat is concentrated in the seeds and ribs if that is an issue for you. Mince the chile pepper. Combine the pomegranate arils, almonds, chopped olives, peppers, and parsley in a bowl. Smash the garlic with some coarse salt to make a puree. Whisk together the garlic, additional salt to taste, olive oil, lemon juice, pomegranate molasses, and black pepper. Pour over the salad and toss gently to blend. Last night I piled the salad on top of pork loin that I had sliced thin and pounded out like scallopini, seasoned with a bit of salt and pepper and a sprinkle of flour and quickly panfried in olive oil. It was a winning combination. I'm going to try the leftover salad on top of some panfried eggplant slices tonight, if I don't just eat it by the spoonful for lunch today. My husband and I sat at the dinner table last night thinking of other things the salad would be good on/with. He thought fish, I thought baked goat cheese... I think I'm going to have to make some more! What do you think? Oh, and as an aside, if you are looking for ways to use pomegranates and pomegranate juice, the big grower's website is loaded with recipes. Just google Pee-Ooh-eM, or pomegranate, you'll find them. Full disclosure, I have absolutely no affiliation with the aforementioned big pomegranate growers, I just like their stuff. 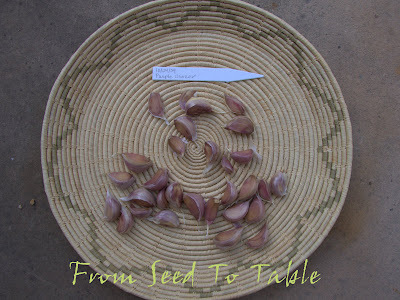 I ordered my seed garlic from Filaree Farm back on July 21 and received it last week. You have to order early if you want to have a large variety to choose from, they sell out of their most popular strains early. They were already sold out of a number of interesting varieties when I placed my order, but there was still a lot to choose from and I think I found some interesting strains. 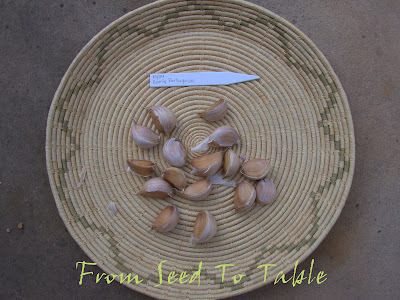 The catalog and website have tons of information about garlic and I've quoted extensively below. Here's a photo of the garlic bed all ready to be planted. I had to do a little work to deter the moles from getting in, arrrgh... 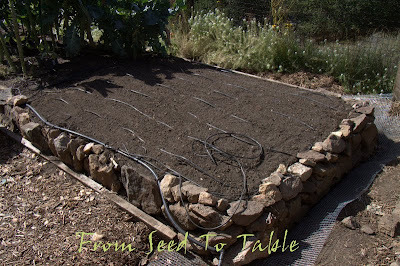 I laid out my drip lines 8 inches apart and planted the cloves 4 inches apart, one row on either side of a line. I worked in some crab meal, sulfate of potash, humic acid, and a slow release turkey poop fertilizer before planting. This year I chose 4 softneck and 4 hardneck varieties. 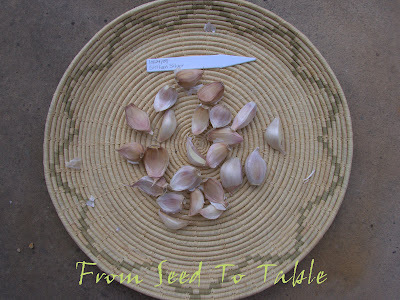 Certain strains of hardneck garlic, such as rocamboles, do best in climates that are colder mine so I avoided those. What I ended up with are 2 Silverskins and 2 Artichoke types, both softnecks. For hardnecks I got 3 Turban types and one Purple Stripe. 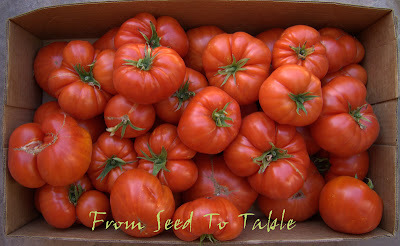 You can read the Filaree Farm descriptions about these various types below. 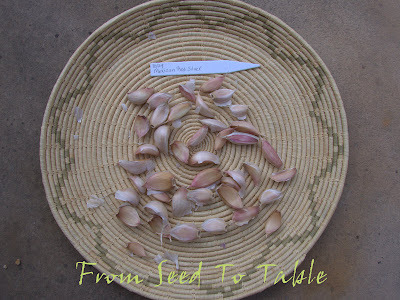 I took photos of the cloves after I separated them all, you can see them above the descriptions that I copied from Filaree Farm. Last year my crop was heavily infected with rust and I ended up with bulbs that were about 1/3 normal size. I've been using it for cooking, it tastes fine, although all those little cloves can be a pain to peel. Silverskins are the type most often found on supermarket shelves due to their very long storage life. They are the highest yielding variety and do well in a wide range of climates, from hot southern to wet maritime and cold northern climates as well. Plant growth is more upright than other types. Leaves are often narrow and pale green despite healthy plants. Silverskins rarely produce flower stalks in mild climates, but may when stressed by cold winters or drought conditions. Bulb wrappers are fine and smooth, usually all white. Three to six clove layers are common. Total cloves per bulb vary from 12 to 20. Outer cloves are usually flat and wide while inner cloves are tall, narrow and concave. Silverskins have long been the most popular garlics for braiders because of the smooth, shiny skin and symmetrical shape. Silverskins are the last to be harvested and may lodge (fall over) a week or more before harvest due to their weak necks. Sicilian Silver (Silverskin) - Even baked you'll experience full complex flavor. Raw it starts mild, then explodes! Original source unknown. 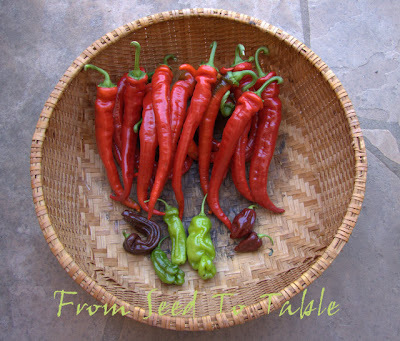 Mexican Red Silver - Enjoy baked with its light flavor and low heat. Relish raw when it's hot and strong. From Mexico via J. Swenson. Artichoke strains are very vigorous and large bulbed. Plants are shorter than hardneck varieties with more spreading rather than upright leaves. The leaves are broader than any other variety and a deeper green than most. While Artichokes do not normally produce a seed head, they often produce large bulbils that protrude from the lower third of the stem. 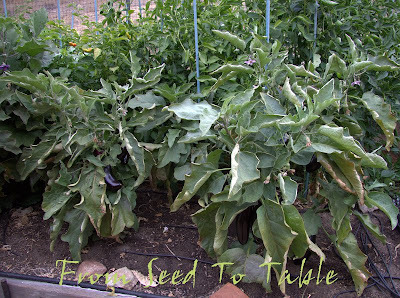 When stressed Artichokes can produce hard necks and seed heads. 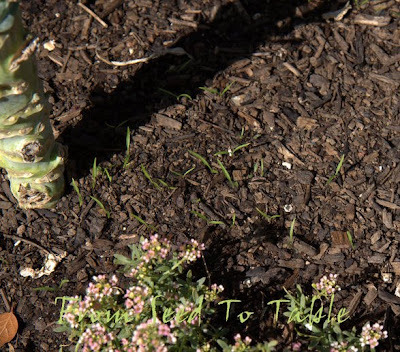 Cloves planted from these bulbs will usually revert to soft necks the following season. Artichokes are named from their configuration of several overlapping layers of cloves, reminiscent of the true Artichoke. Many Artichoke strains have 3 to 5 clove layers containing 12 to 20 total cloves. Outer cloves are fat and roundish but irregular in shape, often with 3 flat sides and a paper tail at the tip. Inner cloves vary in shape from small, narrow & squarish to small & round. Bulb wrappers are coarse and thick, often with light purple blotches or a yellow stain. Some Artichoke strains produce large round, symmetrical bulbs while other have a knobby, asymmetrical appearance. Clove skins adhere fairly tightly, one reason for their longer storage life. Many Artichokes exhibit a mild flavor, a characteristic preferred by those who eat their garlic raw for health reasons. 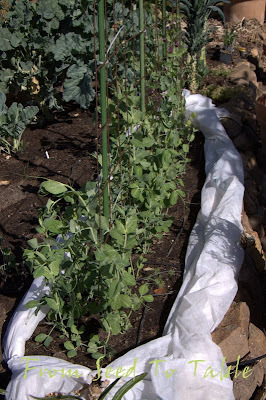 A few strains, however, do produce a bite which can be intensified by cold winter growing conditions. Madrid (Artichoke) - Originally bought in a Madrid marketplace by a California grower. 8 to 10 plump cloves. Mild flavored with just a bit of heat. Thermadrone (Artichoke) - Commercial strain from France. Impressive, large long storing bulbs. Turbans are closely related to Asiatics, being a subgroup of the Artichoke variety. 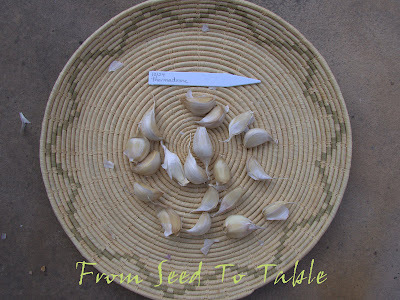 They are weak bolting garlics, and earlier maturing than any other garlic. 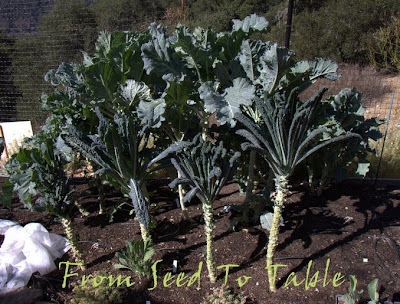 They have a very short period of natural rest, and often begin to sprout by planting time in October. The bulbil capsule is a unique turban shape on some strains. Cloves appear ophio style with light glossy pink to brown colors. 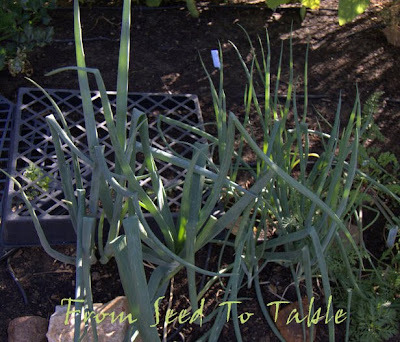 Turban garlics usually attain good size even though plants appear small. The heavily striped bulbs are very attractive and ideal for early season marketing before standard Artichokes reach local markets. Turbans may grow softneck in mild winter climates. China Stripe (Turban) - Delicate purple stripes adorn this attractive bulb. Mild flavor. Purchased in Beijing market by G Czarnecki. Early Portugese (Turban) - Early maturing, forms 8 solid cloves per bulb. Bulb wrapper lightly striped. Sweet taste with just hint of heat. 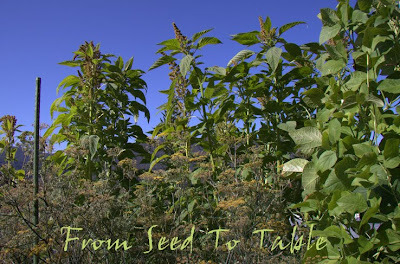 From Salt Spring Seeds via Flora Baartz. 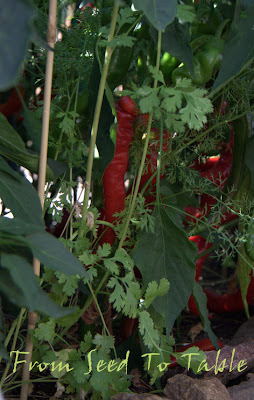 Red Janice (Turban) - Matures slightly later than other Turbans and stores longer. Bulbs have heavy solid stripes over purple blush. Exceptionally fragrant, sweet and a little spicy baked. Starts hot raw and heat continues to build. Originally from Nmarazeni in Republic of Georgia. Named because of the bright purple streaks and blotches on both bulb wrappers & clove skins, these are the most attractive looking garlics. They are also very flavorful, usually winning "best baked garlic" taste tests conducted by Rodale, Sunset Magazine, Martha Stewart and others. 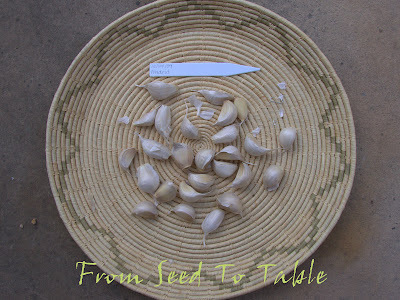 Most strains have 8 to 12 cloves per bulb (more than Rocambole) so clove size is slightly smaller. Cloves are noticeably tallish and crescent shaped. They store slightly longer than Rocamboles & peel almost as easily. Purple Stripe plants are distinctive from Rocamboles because their leaves grow at wider angles to the stem. Flower stalks may make perfect 270 degree curls that leave bulbil capsules floating and bobbing in the air like birds in flight. Plant height & shape vary of individual strains vary significantly. These include four beautiful strains that appear Purple Stripe in all respects except that bulb and clove colors are a royal purple tinged with subtle, shiny gold and/or silver hues. Cloves are not as tallish and elongated as standard Purple Stripes and there are fewer cloves per bulb. They mature slightly sooner than standard Purple Stripes. Purple Glazer (Glazed Purple Stripe) - Similar to Red Rezan. Fat cloves with almost satiny clove wrappers. Originally Mchadidzhvari #1 from Republic of Georgia. 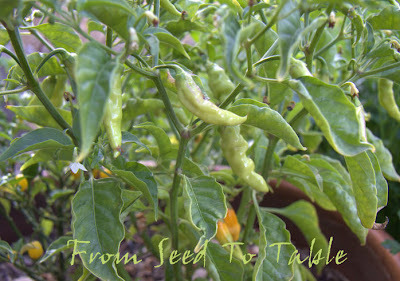 I planted the Turbans as a group as they are the earliest to be harvested. The Silverskins are the last to be harvested, so I planted them in another group. 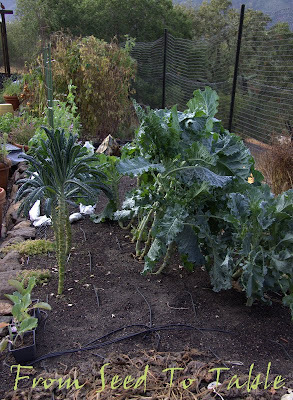 Artichokes are shorter growing so I put them in a group in a couple of outer rows where they won't be overshadowed. Glazed Purple Stripes mature at about the same time as the Silverskins so they were planted with that group. 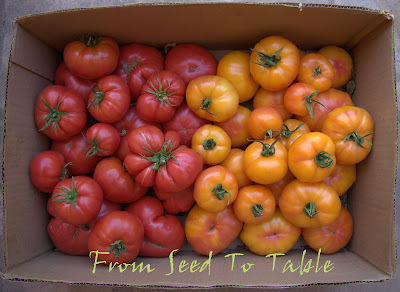 Once again I'm starting my Harvest Monday post with a box of tomatoes. 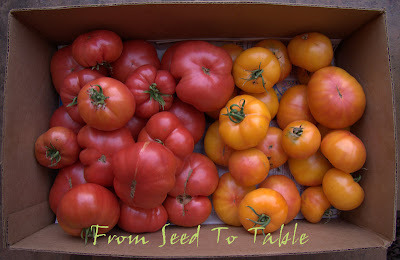 But, what a relief, there was only one box of tomatoes to photograph this past week. Whew! I also picked a small bowl of cherry tomatoes that never got before the camera lense. 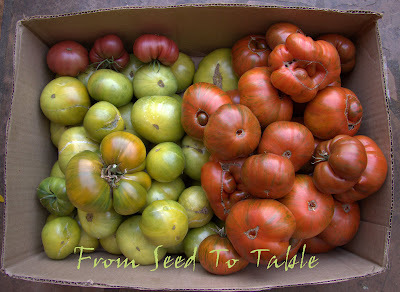 There are still a few tomatoes left to harvest, but now there's more tomatoes headed straight for the compost rather than the harvest box. 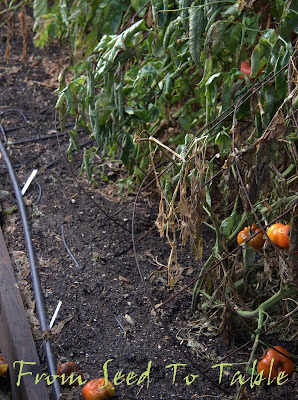 The rain we had the week before last caused a number of tomatoes to spoil and I'm really not all that sorry about it. It won't be long before the plants come out and the favas get planted. The Palace King cucumbers are still coming in and there's a bunch of Marconi Purple sweet peppers ready to harvest. I picked a few last week to add to the tomatoes and cucumbers that I gave to my neighbor. And the basil is still doing well. I think another batch of pesto is in order. The Pimento de Padron peppers are still coming in at a steady pace. 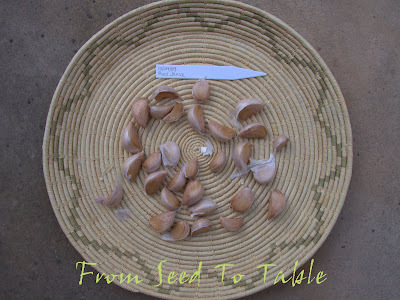 I also picked another basket like the one shown below that I didn't photograph. For some reason there seem to be more hot Padrons now so I'm more careful to pick them when they are small, the larger they get the more likely they are to be hot. The Red Florence fennel seeds are ripening nicely as well. 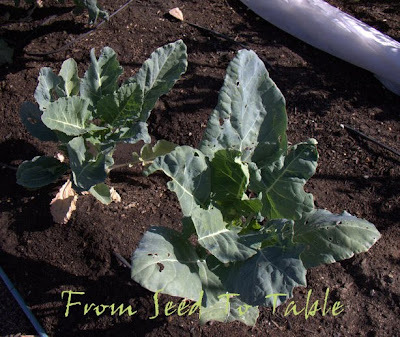 The Piracicaba Broccoli is producing a steady supply of shoots. I picked 2 bunches like the one shown below. It was about 80F on the day I picked this bunch and it started to wilt right away. A wash and a bit of a soak in some cold water perked it up quickly. 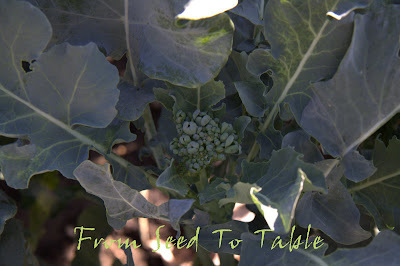 I really like that the broccoli leaves are just as delicious as the buds. To prepare the shoots, I simply trim off any stem ends that are tough (usually not much), then I cook the shoots with leaves still attached in salted boiling water for about 2 minutes, drain and toss with my best extra virgin olive oil, salt and pepper, sometimes a drizzle of balsamic vinegar. Normally I like to steam my veggies, but there are usually a few aphids or a tiny cabbage worm or two hiding in the buds and boiling removes them better than does steaming. 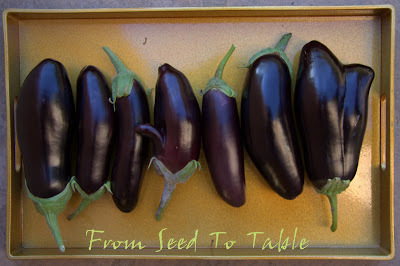 Also harvested this week were 3 Diamond eggplants, a handful of Petaluma Goldrush beans that I allowed to dry on the vine (seed for next year), and about 8 snap beans. I'm giving up on the snap beans, I planted the seeds at the end of July and I've harvested about a dozen beans, and doesn't look there's much more to come. I'm going to try some potatoes in that spot instead. Potatoes supposedly grow in the winter here if they are protected from the frost and I'm willing to experiment since that spot would most likely be empty all winter anyway. 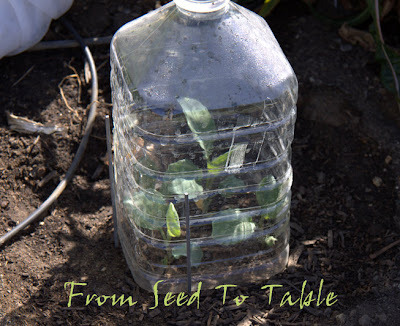 Check out other Harvest Monday posts at Daphne's Dandelions. Show us what you've been harvesting lately also! It's Harvest Monday, hosted by Daphne of Daphne's Dandelions. 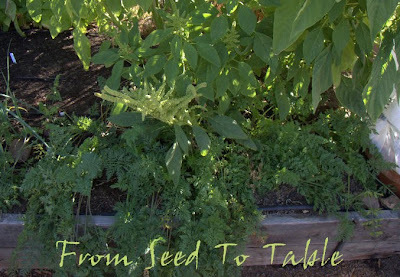 Head on over there to share your harvests and see what other garden bloggers are getting from their gardens. Daphne, I'm sorry to say that I've got one more post full of tomatoes to torment you. But, this week I'll start off with something different. I cleaned out the tomatillo plants and here's the result - a rather heavy basketful of Purple and Plaza Latina Giant tomatillos. Don't ask how much, I haven't weighed them. 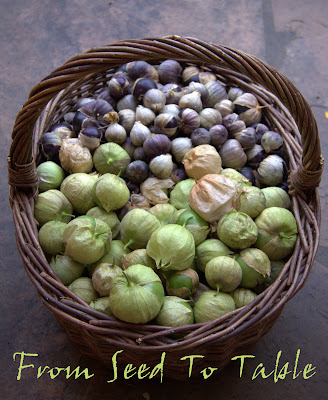 It's a good thing that tomatillos keep really well, I haven't had time to deal with them. Well, onto the tomato harvest. Cherry tomatoes, 7 pounds. Todd County Amish, 10 pounds. 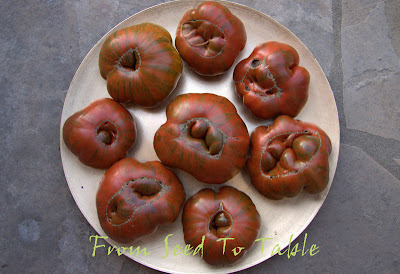 Blue Beech paste tomatoes. I canned 8 pounds from this box before taking a photo, so this is only 12 pounds of the 20 that I picked last week. Caspian Pink and Hillbilly, 15 pounds total. Aunt Ruby's German Green, Chocolate Stripes, and 3 little Black Sea Man, for a total of 24 pounds. So the total tomato harvest last Monday, a frenzy of picking before the big storm hit, came to 93 pounds. 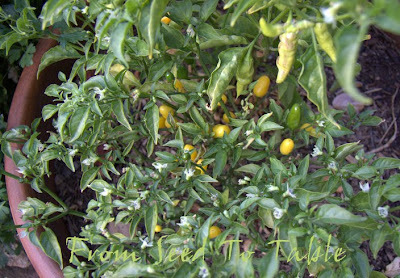 Thursday I harvested all the ripe Piment Doux Long des Landes sweet peppers. There's one ripe Aji Panca and some green ones that got knocked off the plants when I was staking them back into an upright position. And I found a couple of ripe Habanero Long Chocolate. About half of the Doux Long des Landes were cut into strips and sauteed with garlic and thyme until soft and then topped a pizza. 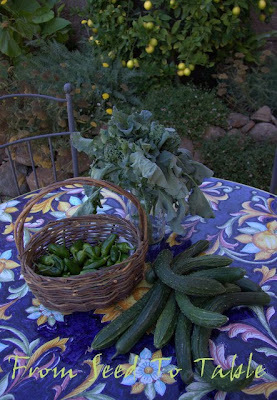 And on Friday I harvested Palace King Cucumbers, Pimento de Padron peppers, and Piracicaba broccoli shoots. Harvests not photographed this week included a few more cucumbers, more broccoli shoots, and a box of tomatoes that pushed the tomato harvest for the week up to at least 100 pounds. 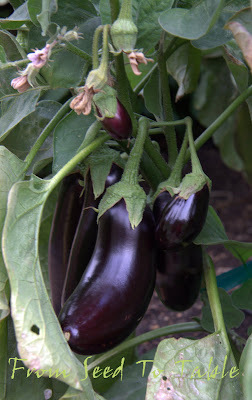 Oh, I forgot, I also harvested a couple of Diamond Eggplant - for pizza! And what have I done with that bounty? 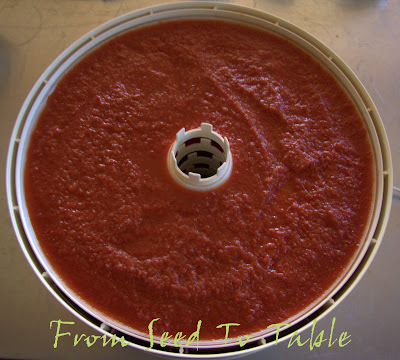 Canned tomatoes, dried tomatoes, frozen puree, frozen sauce, frozen paste, gifts of tomatoes... I even made a small batch of Sweet Tomato Jam, interesting - good with cheese. 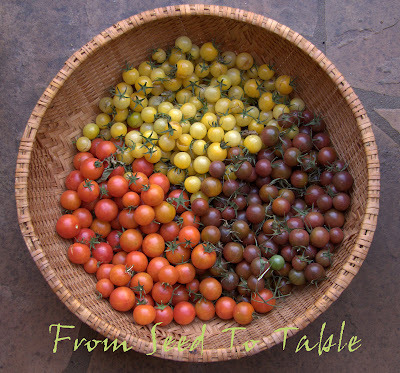 There's one more tomato preserving trick to try. A friend of a friend chops fresh tomatoes and freezes them raw to use for gazpacho. There might be a little bit of room left in the freezer for that. Such strange weather lately, 4 inches of rain last Tuesday and by Friday we had sunny days and temps in the 80'sF. It felt so strange to have that much rain and warm weather. We generally have storms like that in the winter when the temperatures are in the 50sF. Warm temperatures and significant rainfall are just so foreign. There are green shoots starting to appear on the brown hillsides already, that's definitely early, I'm hoping for a bit more rain to keep the green growth. Actually, there is a bit of a chance for rain today. 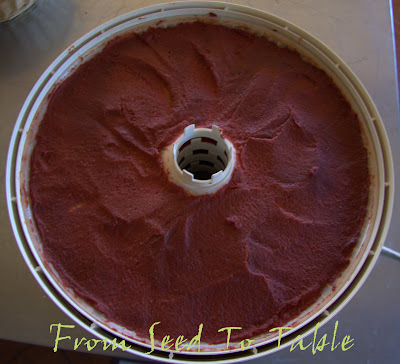 One of my final tomato preserving projects of the season was to make tomato paste. 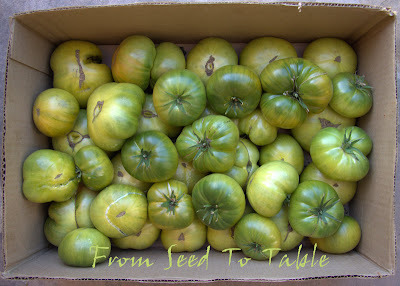 I started with 10+ pounds of Blue Beech paste tomatoes. 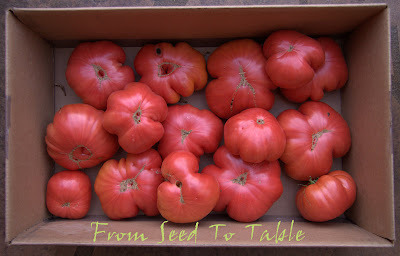 The tomatoes were washed, cut in half lengthwise, and layered cut side up in my largest roasting pan. Those got baked in a 300F oven for about 2 hours, cooled, and then pureed with a food mill. The puree was then simmered on the lowest flame that my stove can produce for a few hours. I stirred it every so often. Once the puree was reduced by about a third I ladled it into shallow trays that fit on the racks of my dehydrator. At this point the puree still weeps a watery juice. It took a few hours to reduce down to a very thick paste. 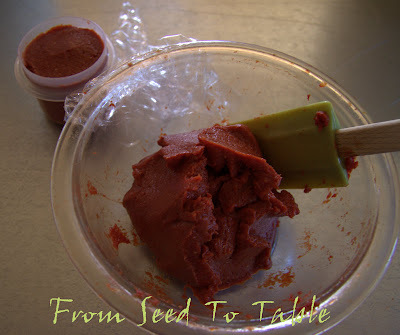 The edges of the puree dry more quickly and can get leathery so I stir the puree a few times during the drying process. The final result is a very thick paste that doesn't weep any watery juice at all. I like to stir the paste together in a bowl and chill it before packing it into containers for the freezer. 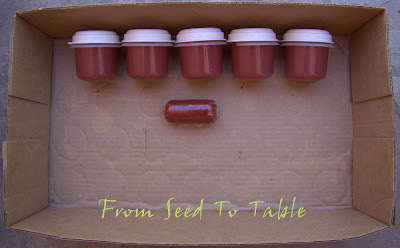 The final result was 27 ounces, 5 ounces per container and one little 2 ounce log rolled in plastic wrap. The paste has such a high sugar content that it doesn't freeze as hard as a rock. I can usually pop it out of the container while frozen and cut off chunks without thawing the entire contents. Whew, that was a blast! Thursday update: I checked the rainfall total for Wednesday through 5:00 PM and it showed an additional 1.4 inches of rain which fell mostly Tuesday evening (barely a trace of rain all day yesterday) so the storm total was 4.05 inches! The amaranth that had been reaching for the sky is now blocking the main path. 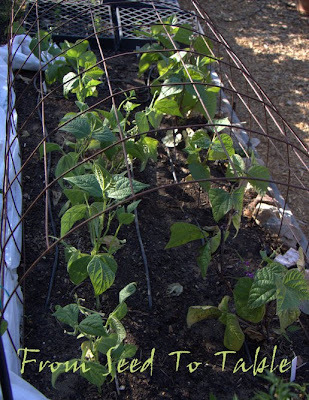 The pole beans were well anchored except for one side of one trellis. 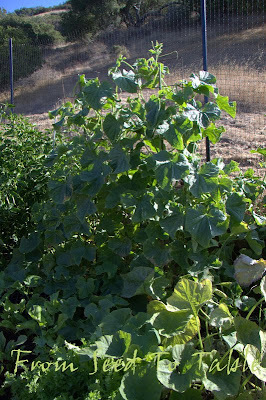 The top heavy Portuguese kale is no longer upright, lucky for it the broccoli plants had less of a tendency to lean over. 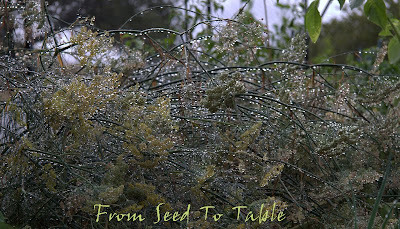 The seed heads on the Red Florence fennel are growing horizontally now. Looking back from the other direction makes the landscape look a bit askew. The direction that the wind was blowing from is obvious. Eggplant and pepper plants with a decided lean. Tilting tomato towers. It's a good thing that I firmly anchored one row of towers, these ones weren't so well done and are leaning onto the other row. 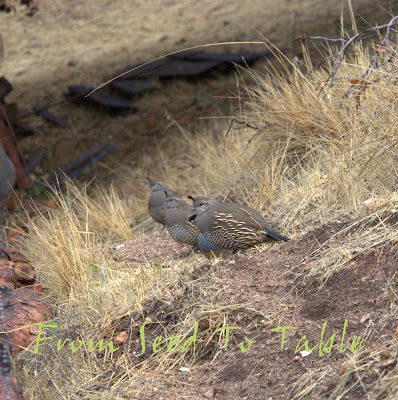 I was being watched the whole time I was photographing the garden by this small family of quail, there's a male hiding behind the first bird. Yesterday would have been a great day to get caught up on my tomato preserving. 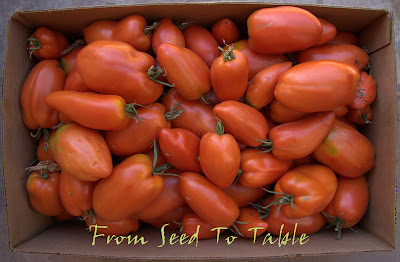 Unfortunately I only had time to put up one batch of canned tomatoes before I had to hit the road for Palo Alto, it was not a fun drive. 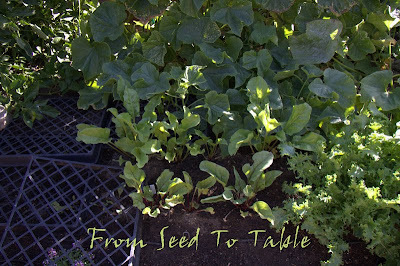 It's Harvest Monday hosted by Daphne at Daphne's Dandelions, time to report on what came out of the garden in the previous week. 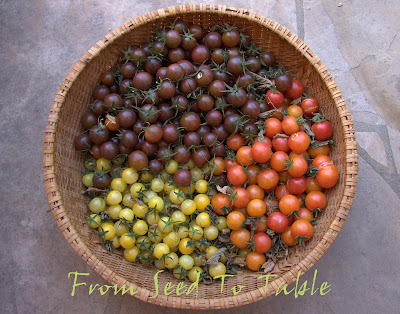 This was Tomato Week in my garden, likely the peak of the 2009 harvest. I decided to weigh each box of tomatoes, just out of curiosity. 17 pounds of Gigantesque (misspelled in previous posts because of a typo on the seed packet). 20 pounds of Blue Beech Paste, plus a few more not photographed. About 5 pounds of Chocolate Stripes. This tomato has only ok flavor but I'm not going to pass judgment on it since the plant really suffered this year and I don't think it is showing its true potential. I'll try it again next year. 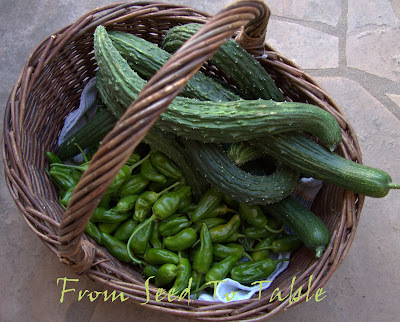 Palace King cucumbers and Pimento de Padron peppers. 15 pounds of Caspian Pink and Hillbilly. 9 pounds of Isis Candy, Galinas, and Black cherry tomatoes. 6 pounds of Paul Robeson. 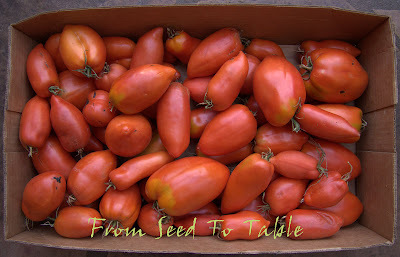 This is usually one of my absolute favorite tomatoes, but this year the plant suffered, the foliage died, the tomatoes got sunburned and didn't size up well. I rescued what I could and turned it into puree which ended up tasting pretty good. 15 pounds of Todd County Amish and Black Sea Man. Thursday: a couple pounds of Diamond Eggplant. This was made into Imam Bayildi - Eggplant stuffed with a tomatoey onion filling - heavenly! 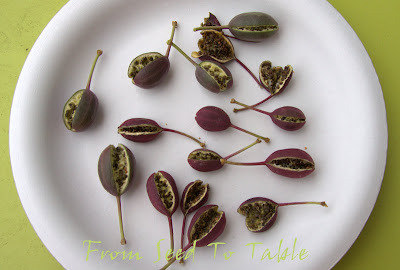 And I've been collecting ripe caper berries from my pink flowering Caper bush for seed saving. Also harvested but not photographed this week was a couple more pounds of Diamond eggplant (made Caponata with most of that) and another picking of Pimento de Padrons and a few more cucumbers. And, I forgot to mention when I originally put this post up, a huge bunch of Piracicaba broccoli. 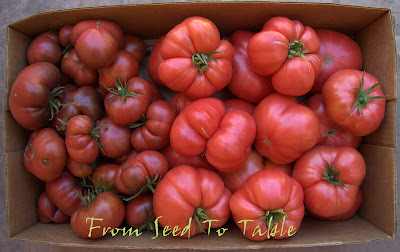 Rain is on the way today, an unusually big storm for this time of year, so I have to get outside and pick MORE tomatoes. 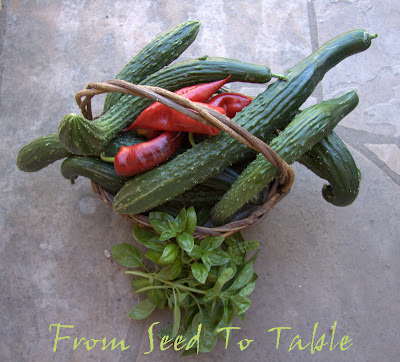 Join in the harvest fun and head on over to Daphne's Dandelions to report on your own harvest and see what other gardeners are harvesting also. I like to photograph the whole garden at times so that I can go back and see the progression over time and I haven't done so in a while so here goes. It's a long post with lots of photos. 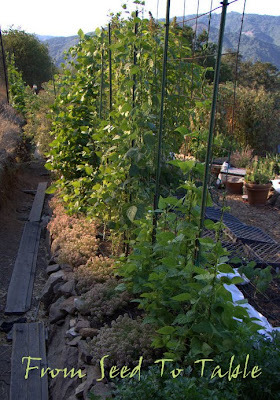 The beans are climbing their trellises but are not as vigorous as I would have expected. I think that the oak trees are sending their roots into this bed and sucking up a lot of nutrients, this bed has been requiring more water than the other beds as well. 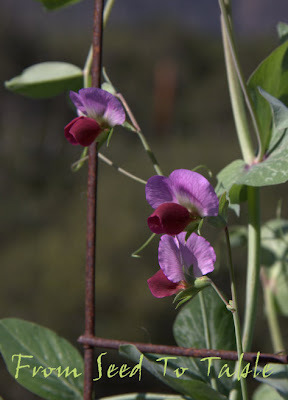 One of the pole beans is Petaluma Gold Rush, chosen by Slow Food for its Ark of Taste. 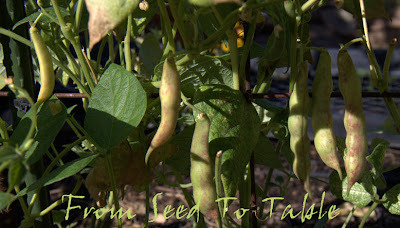 I planted out the last of my beans this summer and fortunately it looks like the plants will produce enough beans to save for planting next year. 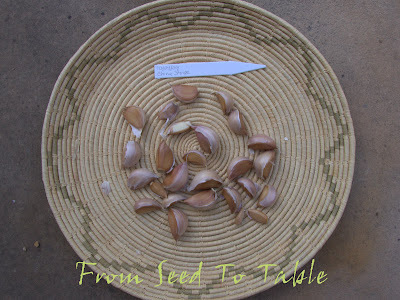 I got my original seeds through the Seed Savers Exchange but the member who offered the seeds is no longer offering seeds through the exchange and these seeds do not seem to be available anywhere now. There is a pot with two chiles in it at this end of the bed. Those little yellow chiles are Pimento de Chiero. They are quite hot and have a wonderful fruity aroma. Most of the heat is in the ribs and I found that I can remove the ribs to reduce the heat but not lose the wonderful flavor and aroma. Sharing space in the pot with the Pimento de Chiero is a Datil pepper. 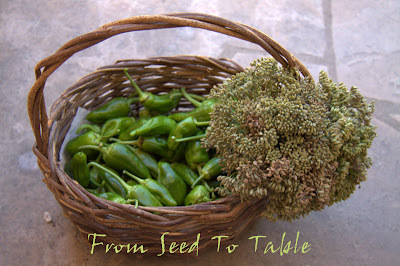 Slow Food has added this pepper to their Ark of Taste also. None of my peppers have ripened yet. Also at this end of the bed are a few bush beans, Rolande filet beans and a tricolor mix from Renee's seeds. These plants are also not very vigorous. There are a few beans setting so I might get a handful one of these days. The Red Florence fennel is nearly done blooming and has tons of seeds. 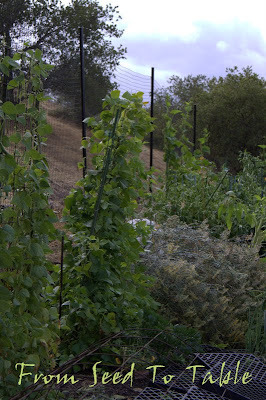 The Vida Verde amaranth mix is towering above the fennel now and is even getting taller than the bean trellises. 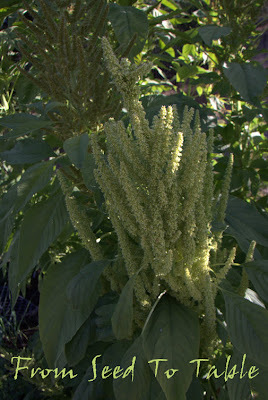 Here's one of the amaranth flower heads. Carrots are growing at the base of the amaranth. I pulled all of them after I photographed them, the crowns were full of aphids being attended by ants, yuck. The aphids don't damage the carrot roots but I just don't want that kind of infestation in the garden. Scallions, some of them are getting a bit big. Carrot seedlings growing under the protection of overturned nursery flats. I seem to have to protect the seedlings of everything these days. My only surviving Diamante celery root. On to the pepper/squash/eggplant bed. The brown stuff in back is the tomato bed. 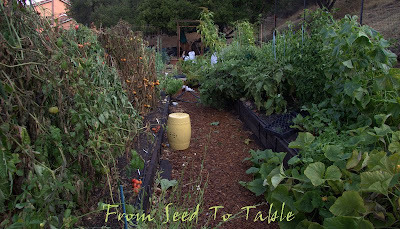 Looking down at the pepper and tomato beds. 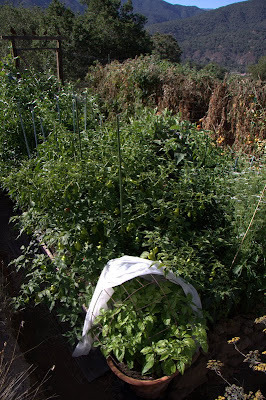 You can see how some of the tomato plants are getting crispy, the leaves rustle in the breeze... 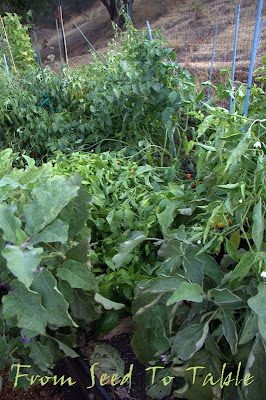 But there's still lots of tomatoes left on the greener plants. 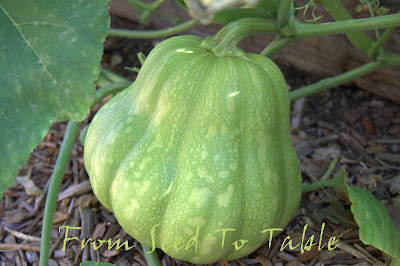 The Magadalena Big Cheese and Berrettina Piacentina squashes are running rampant in one corner of the garden. You can see them climbing up the garden fence. Magadalena Big Cheese squash. 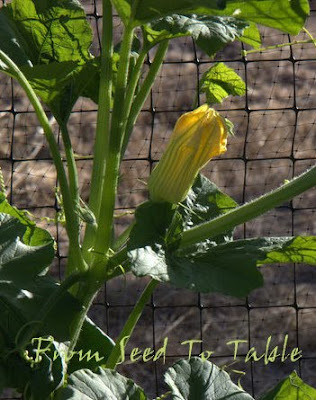 I wonder if this is true to type, the photo on the Native Seeds Search site shows a larger more round squash. The Berrettina Piacentina female blossoms are huge. A few close ups of peppers. 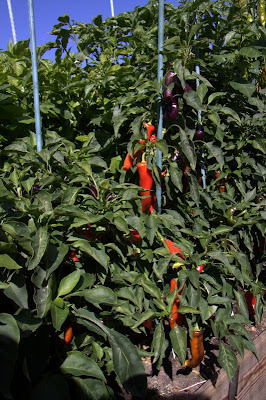 This is Piment Doux Long des Landes, a sweet pepper from France. Marconi Purple sweet peppers. 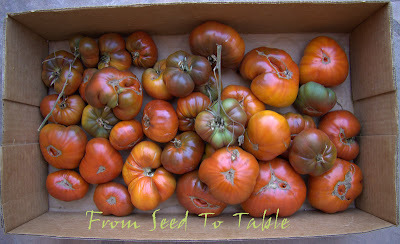 They start purple and ripen to red. 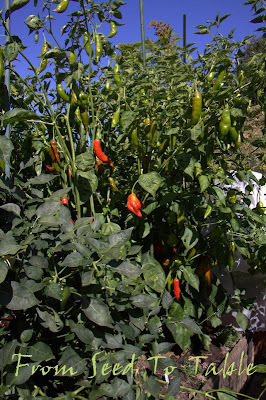 Aji Angelo, a baccatum chile with medium heat. I've only tasted one so far and it seems like it would be good in salsa. 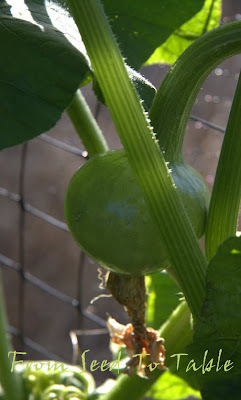 The Palace King cucumbers have grown to the top of their trellis. They seem to be slowing down a bit now and I've seen the first spots of powdery mildew on a few leaves. Pancalieri a Costa Bianca frisee nestled in near the squash. And next to the frisee are a few beets that survived the rats. I'm trying to get a few more going under the nursery flats. There's Chioggia and Dewings Early Blood Turnip shown. The Burpee's Golden beets that I've been trying to grow just don't seem to make it. I think one surviving plant is hidden in there somewhere. Diamond Eggplant. 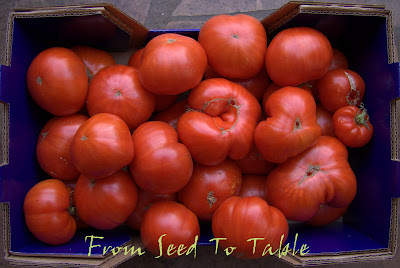 This variety is from the Ukraine and is great for cool or short season areas. It is one of the best eggplant I've ever grown, not only because it does well in my cool climate but because it is delicious. 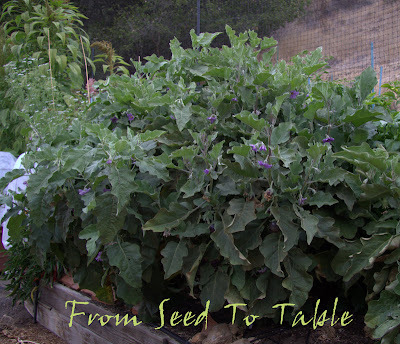 Even the mature eggplant that I've picked have had few seeds and have not been at all bitter. I'll be growing these again next year. 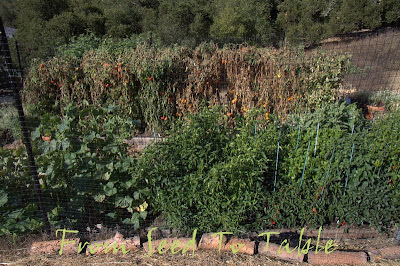 The plants are a bit scruffy looking and had a lot of the lower leaves chewed off by rabbits, but they are still producing a lot of good quality fruits. There were some spider mites on the leaves earlier but they don't seem to have done too much damage to the plants. I've also noticed powdery mildew on the caps of some of the fruits, but that also doesn't seem to be problematic. The Thai Round Petch Parisa plants are huge, covered with flowers and fruits. My husband announced to me one day that he wasn't really crazy about those little eggplant... There's only just so much eggplant curry that I can eat. Oh well. I'm skipping a closer look at the tomato bed this time around. 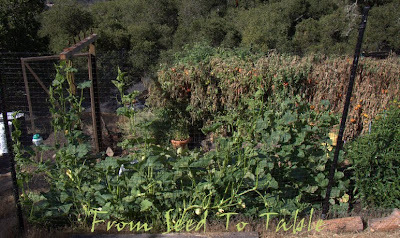 There are plenty of photos of tomatoes on my harvest posts and you get a good idea of the state of things from the big view. The snow and snap peas are getting going. 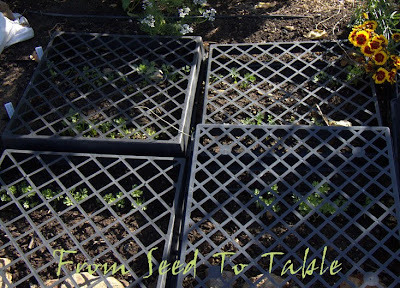 I managed to protect them as seedlings with a light weight row cover. It's still rolled up around the base of the plants just in case... The Opal Creek Golden Snap are in the foreground, they are larger plants than the Kefe Beinwil snow peas. Although, the Kefe Beinwils are already starting to bloom. 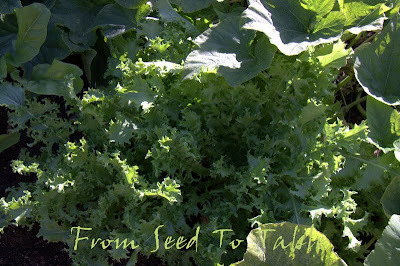 The kales pretty much survived the summer aphid infestation. One of the Cavolo Laciniato plants has started to bolt. I cut the top off and have been harvesting side shoots for the chickens. They do love kale. 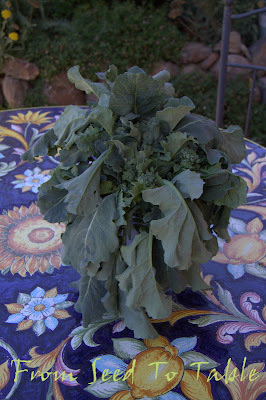 The Piracicaba broccoli is still pumping out the side shoots. 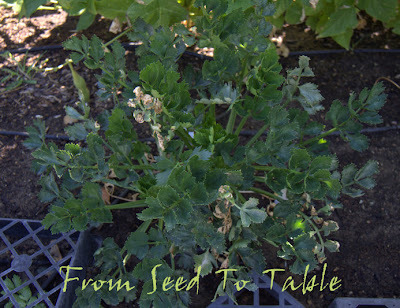 I'm trying a new kale this winter, Cavolo Laciniato (Smooth Leaf Kale). And I'm still trying to get a Romanesco broccoli plant going. I don't think I'll be getting anything like the harvest I got last winter. And here's some chervil sprouting that I sowed at the base of the kale plants. And now I have to get back to tomato preserving. 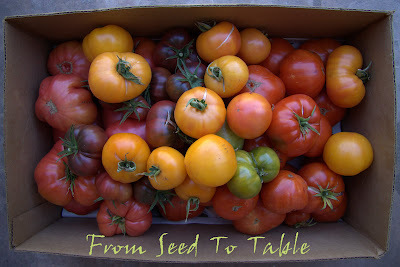 Come back Monday for the harvest post to see my treasure trove of tomatoes!